The MotoGP™ classes treated fans to some exciting racing this weekend at the bwin Grand Prix České republiky in Brno with Repsol Honda Team’s Dani Pedrosa storming to a thrilling victory in the premier-class ahead of Jorge Lorenzo and Cal Crutchlow, opening up the championship race once more. It was Team CatalunyaCaixa Repsol’s Marc Márquez who took a stunning win in a close-fought Moto2™ race at the bwin Grand Prix České republiky in Brno in front of Tom Lüthi and Pol Espargaró. 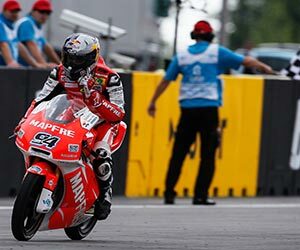 In an enthralling Moto3™ race at the bwin Grand Prix České republiky in Brno it was Mapfre Aspar Team Moto3’s Jonas Folger who held his nerve in drying conditions to take victory in front of Luis Salom and Sandro Cortese. 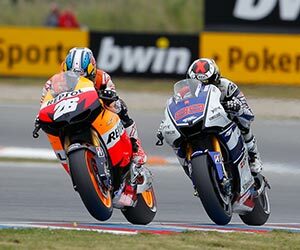 Dani Pedrosa (Repsol Honda RC213V) scored a magnificent and crucial victory at Brno this afternoon, defeating World Championship rival Jorge Lorenzo (Yamaha) in a breathtaking last-lap duel. Pedrosa’s second win in eight days confirms that he is on the charge and reduces Lorenzo’s series advantage to 13 points with six races remaining. With Pedrosa’s team-mate Casey Stoner (Repsol Honda RC213V) absent due to an injury sustained at last weekend’s Indianapolis Grand Prix, the two Spaniards were in a class of their own today, quickly pulling clear of the pack and settling into a tense duel. Throughout the 22 laps they were never separated by more than half a second, the pair usually just a few metres apart around the majestic Czech circuit. Lorenzo led into the first corner from pole position, with Pedrosa right behind him. From there on the pair traded fastest laps, Pedrosa taking the lead for the first time at turn three on lap 12. He stayed there until the last lap when Lorenzo managed to get pass on the inside at turn seven. Half a lap later, as they sped up the hill towards the final esses, Pedrosa was able to use his Honda’s superior power to retake the lead. Lorenzo then tried to go round the outside into the esses, but that pushed him wide and Pedrosa was ahead once more. He crossed the line 0.178s in front, triggering jubilant celebrations in the Repsol Honda camp. Pedrosa’s third victory of the year (following wins at the Sachsenring and Indianapolis) is also his 11th podium finish from the first 12 races. So far the only race he has finished outside the top three was the rain-lashed French GP, which he finished in fourth position. MotoGP rookie Stefan Bradl (LCR Honda MotoGP RC213V) had a great ride to fifth place, the reigning Moto2 World Champion enjoying a mid-race skirmish with Valentino Rossi (Ducati). Earlier in the race he had lost some time when Rossi’s machine started smoking, throwing oil onto his visor. Once back in the groove the German was fast and consistent, moving past several riders to record another strong result in what is turning out to be a very impressive rookie MotoGP season. Alvaro Bautista (San Carlo Honda Gresini RC213V) ran with Bradl and Rossi, also getting the better of the Ducati rider, but the Spaniard was unable to run Bradl’s pace and he finished the race four seconds behind his fellow RCV rider in sixth place. Bautista believes that today’s cooler conditions caused him some issues with front-end chatter and rear-end grip. Michele Pirro (San Carlo Honda Gresini FTR-Honda) had another challenging weekend, but his crew worked hard to solve their problems and the Italian was able to score some points in 14th place, a morale booster following several DNFs at recent events. Stoner is currently in Australia awaiting surgery on his right ankle, which sustained complex ligament, cartilage and bone damage when he crashed heavily during Indy GP qualifying nine days ago. He heroically rode to fourth place in the race but on arrival at Brno he was told by his Australian surgeon that he risked doing permanent damage if he continued riding. Thus Stoner flew to Australia the same day and will undergo an operation within the next few days, once the swelling has subsided. In the Moto2 class Marc Marquez (Team CatalunyaCaixa Repsol-Suter) won a tense four-way tussle with Thomas Luthi (Interwetten-Paddock-Suter), Pol Espargaro (Pons 40 HP Tuenti-Kalex) and Andrea Iannone (Speed Master – Speed Up) to take his sixth victory of 2012 in the always thrilling Honda-powered series. Marquez’s winning margin over Luthi was just 0.061s, while the four riders were covered by just half a second. With six races to go, Marquez heads Espargaro by 48 points. The ever-impressive Marquez played his hand perfectly, spending nearly all the race in second place, while Luthi did all the leading. Right behind them Espargaro and Iannone swapped places frequently. Both of them briefly made it into second place but didn’t quite have the pace to stay there. Marquez made his winning move at turn three with three laps to go, sweeping past Luthi, backing into the corner and yet keeping his Suter perfectly on line. Luthi was able to stay with the 19-year-old and tried everything he knew to retake the lead but couldn’t quite make it. The duel between Espargaro and Iannone was just as intense, and complicated somewhat when Espargaro made a pass under yellow flags. He was ordered to drop back to fourth to escape punishment and although he tried everything to get back on terms with the leading duo – including setting the fastest lap – he could not get close enough to attack. Espargaro finished less than three tenths behind Luthi, with last year’s Brno winner Iannone less than a tenth further back in fourth. Simone Corsi (Came Ioda Racing Project – FTR) led the rest of the pack, finishing just ahead of Alex De Angelis (NGM Mobile Forward Racing – FTR) who rode a brave race after taking a big tumble yesterday. Johann Zarco (JIR Moto2 – Motobi) was top rookie in seventh, just in front of Bradley Smith (Tech 3 Racing – Tech 3) and Mika Kallio (Marc VDS Racing Team – Kalex). Just 1.2 seconds separated Kallio in ninth from Corsi in fifth. Maverick Vinales (Blusens Avintia – FTR Honda) had a tough ride to fourth place in today’s opening race, the 11th round of the 17-event Moto3 series. The 19-lap race got underway on a partially damp track, so there were plenty of position changes in the early stages as some riders were braver than others in the treacherous conditions. All but two riders chose slick tyres despite damp patches all round the track, but title rivals Vinales and Sandro Cortese (KTM) made steady starts, fully aware of what they would be throwing away if they crashed out. The man who made the best of the drying circuit was Jonas Folger, who took the lead on lap four from Efren Vazquez (JHK T-Shirt Laglisse – FTR Honda), one of the two riders who had started on rain tyres. Vazquez finished the race in 25th position. At the end Folger crossed the line almost six seconds ahead of fellow KTM rider Luis Salom. It was rookie Folger’s first Grand Prix victory, just two races after he had switched teams. Cortese lost out to Salom at the final esses, but won his duel with Vinales to finish third and further extend his championship lead over Vinales to 32 points. Vinales did everything he knew how, but he lacked top-end performance at a track where horsepower has always counted. The next two Honda riders were both rookies and both of them finished fractions of a second behind Vinales: Alex Rins (Estrella Galicia 0.0 – Suter Honda) in fifth and local star Jakub Kornfeil (Thomas Sabo GP Team – Honda) in sixth. Kornfeil’s result was his best so far, but also a bit of a disappointment because he had held second place for much of the race, before being overcome by Cortese, Vinales and others. Spanish GP winner Romano Fenati (Team Italian FMI – FTR- Honda) finished eighth, just ahead of Miguel Oliveira (Estrella Galicia 0.0 – Suter Honda). MotoGP riders will stay on at Brno for a day of testing tomorrow. The paddock reconvenes at Misano for the San Marino Grand Prix on September 16. Yamaha Factory racing rider Jorge Lorenzo put on an incredible show today in the Grand Prix of Czech Republic, dueling with rival Dani Pedrosa for an incredible 22 laps to take second at the line. Lorenzo took the hole shot from pole and led for the first 11 laps with Pedrosa running consistently half a second or less behind. The pair swapped positions mid-race and continued their Spanish duel, racing at speeds in excess of 300km/hr less than half a second apart until a dramatic final lap showdown. The Yamaha rider made a brave pass inside Pedrosa heading into the final chicane, only to run slightly wide and allow the fellow Spaniard back through. The drama continued through the final corner and to the line, Pedrosa claiming victory by a margin of just 0.178 seconds. Team-mate Ben Spies had a promising weekend compromised yet again as his run of bad luck continues to haunt him. The Texan’s clutch overheated from the race start, taking a couple of laps to cool down before it became 100% effective again. The issue initially dropped the unlucky rider down to 14th before he made a spirited comeback, climbing six places to eighth by lap eight where unfortunately he crashed. Today’s race results keep Lorenzo leading the Championship with a 13-point advantage of Pedrosa. Spies remains in 10th position. The Yamaha Factory Racing Team will remain in Brno for a one-day test tomorrow. 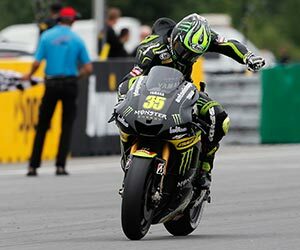 Monster Yamaha Tech 3 Team rider Cal Crutchlow rounded off a memorable weekend with a stunning ride to his first MotoGP podium finish in today’s bwin Grand Prix Ceske Republiky at the Brno circuit. After signing a new one-year deal to remain with the Monster Yamaha Tech 3 Team in 2013 yesterday, the 26-year-old then powered his YZR-M1 to second place in qualifying to score a career best grid position. He then capped the best weekend of his MotoGP career with a fantastic ride to third position in today’s 22-lap race, a result that saw him become the first British rider since 2000 to finish on a MotoGP podium. Crutchlow brilliantly capitalised on his fourth front row start of the season to lead the pursuit of fast starting Spanish duo Jorge Lorenzo and Dani Pedrosa in the early laps. He was immediately able to set a fast and consistent rhythm and he impressively pulled away from Monster Yamaha Tech 3 team-mate Andrea Dovizioso in fourth. The Italian was doing everything within his power to cut the gap to Crutchlow as he went in search of a sixth podium in eight races. But Crutchlow demonstrated fantastic concentration and speed to ensure Dovizioso never threatened to deny him a landmark first rostrum. Dovizioso was able to comfortably secure his seventh successive top four finish after he had held off an early challenge from compatriot Valentino Rossi. Today’s result continued a phenomenal season for the Monster Yamaha Tech 3 squad. Crutchlow’s third position was the sixth podium in the last eight races for the French-based squad. And with 272-points in the Team World Championship standings, the Monster Yamaha Tech 3 Team trails Yamaha’s Factory squad by just 39-points with six races of the 2012 campaign remaining. Following a very promising warm-up session on a wet track, Valentino Rossi’s race in the Czech Republic proved to be more difficult than anticipated. An oil leak, which didn’t hurt engine performance, nonetheless certainly affected riding conditions for the Italian. When he also suffered a loss of tyre grip, he was forced to slow and eventually finished seventh. The Ducati Team will now travel to the Misano circuit, where Valentino will participate in a two-day test on Tuesday and Wednesday. His teammate Nicky Hayden will miss the test while he recuperates in the United States, but he is expected to return for the Grand Prix of San Marino. Repsol Honda’s Dani Pedrosa came out on top of a momentous last lap battle with Factory Yamaha Racing’s Jorge Lorenzo to score his second successive MotoGP™ victory and move even closer to his compatriot in the championship standings. The race started at a fierce pace with Lorenzo leading Pedrosa for the first half of the race, the two riders pushing each other to set a new circuit lap record on six consecutive laps, with a new mark of 1’56.274 set by Lorenzo on lap eight. 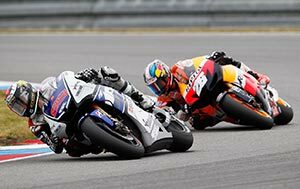 After Pedrosa made his way past Lorenzo on lap eleven, the two riders held position until the last lap where Lorenzo squeezed past Pedrosa, before the Repsol Honda rider hit back at the final corner, getting the better drive to the line to win the race by 0.178 seconds. Monster Yamaha Tech3’s Cal Crutchlow also rode a faultless race to claim his first ever MotoGP™ podium by taking third place, while Power Electronics Aspar’s Randy de Puniet made the most of his good qualifying performance to cross the finish line in eighth position to be the highest placed CRT rider. Rain fell overnight and on Sunday morning at Brno, causing less than ideal grip levels on the circuit, while a cool breeze and cloud cover kept track temperatures low. These conditions placed a premium on greater edge grip and warm-up performance for the rear tyre, resulting in every rider selecting the softer rear option, the medium compound slick for the race. Front tyre choice was also uniform across the field with every rider selecting the harder front slick; the extra-hard compound providing optimum cornering and braking stability with only a slight compromise in grip compared to the softer option. Although track conditions weren’t particularly favourable, the wider operating temperature range of the 2012 specification tyres allowed riders to effectively use the extra power of the 1000cc machines in the cool temperatures. Pedrosa’s consecutive victories at Indianapolis and Brno have closed the gap to Lorenzo in the MotoGP™ championship to just thirteen points with six rounds remaining. Livio Loi won Red Bull MotoGP Rookies Cup Race 2 of the Grand Prix of the Czech Republic, lapping Brno over a second quicker than anyone else in the field. The 15 year old Belgian won by almost 6 seconds and it would have been more had the race not been red flagged with 10 of the 14 laps complete. Heading the fierce pack behind, American 15 year old Joe Roberts took 2nd just ahead of Italian 13 year old Stefano Manzi. It was a dramatic event from the beginning, Cup leader Florian Alt did not get a great start from the middle of the front row and it was the 14 year old Spaniards Jorge Martin and Marcos Ramirez who had qualified 3rd and 4th who got the jump. Saturday’s winner Karel Hanika, the 16 year old Czech, crashed out on the 1st lap when he got onto the astroturf edging the track in the stadium section, it was wet from rain early in the day and offered no grip. He crashed hard but got up and remounted to finish 16th. From there it was the usual intense Rookies Cup battle, very different to Saturday’s race where Loi and Alt had opened up an early advantage. This time it was 3 or 4 abreast for much of the lap and no one could get clear. Loi was in the midst of it but looking very cool while those around him thrashed it out. Alt hit the front but could not get away from the pack, as far as Cup points are concerned a crucial fact was that Philipp Oettl did not make the start. The 16 year old German, 3rd in the points coming into the weekend, finished Race 1 exhausted and was running a high temperature through into Sunday, he was advised not to race. Scott Deroue, 2nd in the points chase, had only finished 9th in Race 1 but was optimistic of better after raising the rear of the bike in the hope that it would stop the bike running wide, his major problem from Saturday. It seemed to be working as he was right in the midst of the lead pack but on lap 9 he crashed out in spectacular style and looked fortunate to walk away unscathed. So Alt was gifted a further points advantage as long as he crossed the finish line. He did not know that Deroue had fallen behind him so he pressed on. Loi had taken the lead on lap 6 and did so at such a pace that no one had any kind of response. He romped away in a most un-Rookies Cup like fashion. The race was red flagged when Jorge Martin and Willi Albert crashed as Albert needed attention at the track side. Roberts had been 2nd across the line on the previous lap and took that place on the podium. “I think that was the most intense race I’ve ever been in,” he said. “We were rubbing elbows everywhere, it was incredible, so much fun. This year has been tough but we’ve been working at getting the bike sorted and that paid off today,” concluded the lap record holder who’s time was not quite matched by Loi. Manzi was equally thrilled with his 3rd. “It was a great race, absolutely fantastic. I got a good start and was 7th into the 1st corner, I was in the pack and fighting with everyone else, we were having a great time and I am so happy to be on the podium again,” said the tiny Italian who was 2nd in Race 2 at the Sachsenring. Jorge Martin broke his left collarbone and bones in his right hand in the crash that brought out the red flag. Willi Albert was concussed in the same incident and complained of pain in his right shoulder so has been taken to hospital for further checks. Simon Danilo, the 15 year old Frenchman who crashed on the last lap of Saturday’s race was air lifted to the Brno Hospital where he underwent an operation that evening to stabilise vertebra 8 and 9. He had broken his leg and arm and these were also operated on. He has neurological injuries and the prognosis is not immediately clear. The thoughts of everyone in the Rookies Cup, his friends, fellow racers and fans are with him.